We are the people of Saint Rose of Lima Catholic Church: guided by the Spirit, blessed with an abundance of talents that we use in service for God and our diverse parish community, and united together as a Catholic faith family living Christian values. Recognizing and utilizing the talents of our members, we dedicate ourselves to the deepening of our relationship with God by worship (Sacraments) and prayer, education and evangelization, and the support for and spiritual growth of our members. Opportunities for variety in celebrating the Liturgy and the Sacraments including ecumenical services and projects. Respecting each other through valuing others' time, needs, and hopes. Educating our children and adults through Religious Education, Parochial School, Christian Initiation of Adults and Children, Adult Faith Formation, Bible Study, Disciples on Mission, Liturgy Preparing, and Sacramental Preparation Classes. Thinking of becoming a parishioner at Saint Rose of Lima? If you wish to participate fully in our Parish life, we will welcome you! Please, register in the Rectory Office at 5514 Roselawn Avenue, Monday through Friday between 9:00 AM and 3:00 PM. To volunteer for Parish Ministries or to discuss how Saint Rose may be present to your faith journey, kindly schedule a meeting with our Pastor. Our Lord and Savior lifted up his voice and said with incomparable majesty: "Let all men know that grace comes after tribulation. Let them know that without the burden of afflictions it is impossible to reach the height of grace. Let them know that the gifts of grace increase as the struggles increase. Let men take care not to stray and be deceived. This is the only true stairway to paradise, and without the cross they can find no road to climb to heaven." Towards the close of the 16th century, the people of Lima, Peru, were a pleasure-loving lot, more concerned about good food and good wines than about the salvation of their souls. The demand was for something out of the ordinary for sanctity that was heroic in proportions and clearly it was part of the wisdom of heaven that Rose de Flores should appear at precisely this moment when her presence and example should produce the most telling effects. Saint Rose was born in Lima, in 1586, and was one of ten children. From her earliest years, Rose was very distrustful of herself and took small stock in her own human judgments. Thus she came to lean heavily on the advice of her parents and of the confessors who guided her spiritual affairs. Rose had little time for the ordinary needs of the body and much less for its comforts. It was not that she saw wrong in the good things of earth or in any body's enjoying them. Actually, to one of her delicate instincts and feelings, the niceties of life had an innate appeal. Yet she resisted their lure and crucified her appetites. Though she was exquisitely beautiful, both in face and in figure, yet she made no capital of her gifts which other young women would have given a fortune to possess. When she was 20 she resolved to put on the white wool of Saint Dominic and become a member of his Third Order. It was logical that her thoughts should turn to the Dominicans since their church was her favorite haunt from the time she could walk. Like her great model, Saint Catherine of Siena, she decided that her vocation lay in the world where she would always be at the beck and call of her family and friends and of the sick and impoverished. The short span of years left to her was now to be spent in showing her neighbors how to imitate Christ. And so, while swearing to be faithful to her vows, she continued to dwell in the society of seculars subject to her parents in temporal matters and to Christ through His Church in matters of eternity. 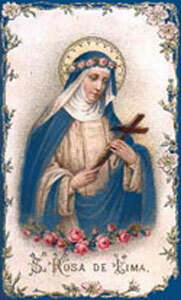 The Third Order of Saint Dominic is known as the Order of Penance; and with her entrance into its ranks, Rose began to increase her austerities. The use of the scourge and the hairshirt had long been a matter of routine. To these she added a small metal crown whose sharp edged she kept constantly shifting in order to multiply the wounds on her head. Often she went without food for a week at a time, finding complete satisfaction in the Bread of the Eucharist. Of course, such utter disregard of all considerations of health was bound to have its effects and it is easy to understand how the charity that burned in her heart reached so intense a degree that the body cold not keep pace with its demands. The saint's prayers and penances were redoubled, until only the slenderest thread held her spirit and body together. Death finally struck and Rose went to her eternal reward on the 24th of August, 1616. It is uncommon for a prophet to be accepted in his own day and country. Yet Rose was acclaimed in her lifetime and cherished with the deepest affection by her friends and the city in which she was born. With all her holiness, she was human; and human she remained until the day of her death. We have recounted her pains and sufferings, but even at their worst, these still did not stop her from serving others with joy. Rose's humanity stretched out in her fondness of nature. One of her deepest delights was the cultivation of flowers which she carried about the city to bedeck the altars and shrines of our Lady. These and a thousand other details were recalled by the many in Peru when Rose was raised to the altars in 1671. Her feast day was appointed as August 30th and at the same time, she was proclaimed Patroness of the Philippines as well as of all the Americas, as she is the first canonized saint of the western hemisphere. Author: Unknown. Taken from the materials/documents in the Parish archives. If you know the author, please contact our Web Designer. It's been a journey of faith, as we celebrate over 90 years as a parish community. Our Saint Rose of Lima parish family has grown from a few dozen members in 1924, to more than 800 families today. Our Journey of Faith began in early 1920's. The Eldorado section of Altoona was growing, and Catholic residents yearned for a neighborhood church of their own. In the first months of 1924, Bishop John McCort purchased a building lot on the corner of 56th Street and Roselawn Avenue. Interested area residents were invited to a planning session at the home of Clarence and Pauline Lockard, who lived at 5506 4th Avenue. They met with Father John McAllister, who was Secretary to the Bishop. All were in agreement to move forward with planning the new parish, to include building a chapel of worship. The small chapel arrived at Roselawn Avenue in segments, and was erected with volunteer labor. The first Mass for this new parish was offered by Bishop McCort on Sunday, August 17, 1924. Father McAllister, who had shepherded this project from the planning stages through construction, was fittingly appointed to serve as the first pastor. Perhaps more significantly, Saint Rose of Lima was selected as the patron saint and parish namesake, because she was the first canonized saint in the Americas. The church was located on Roselawn Avenue, therefore the new name seemed a natural choice. A decade later, the parish family had outgrown the small church, and Father McAllister purchased a convent down the street, that had formerly housed the order of Discalced Carmelite nuns. The convent's chapel was expanded and renovated to serve Saint Rose of Lima's growing congregation. In 1955, a parish dream inched closer to reality, with the launch of a major fund drive to build a new, much larger church and elementary school to educate the children of Saint Rose. Our current church was dedicated on December 4, 1958. Saint Rose of Lima Catholic School opened its doors in September of the following year, staffed by the Sisters of Divine Providence. In the remaining forty years, the parish family has swelled to more than one thousand families, and the school census has reached its full complement. The elementary school serves children through the eighth grade, and has recently added Kindergarten and Pre-Kindergarten programs. A building program in 1977 added a new rectory to Saint Rose, and additional school facilities to include a library, administrative offices and more classrooms. In 2001 a new wing was added to the school building, adding an additional four classrooms. With this addition, the outdoor devotional setting was moved to the front of the church, and is a place for quiet meditation and prayer. The Saint Rose of Lima campus has grown with the acquisition of a private home on Roselawn Avenue, to become Saint Martin's House, the new parish center for meetings and adult education activities. Other properties purchased adjacent to the church ground has created space for a new basketball court, playground, and more parking. In 2003 Saint Martin's House was sold and moved when The Maria Parish Center was erected on the corner of 56th and Roselawn Avenue. This new building serves both the parish and the school as a reception hall and gymnasium. Around 2010 Saint Rose of Lima purchased the home between our parking lots on Sixth Avenue. It was rented out for a few years before it was sold and moved off of the property in the fall of 2015. Mostly taken from: "St. Rose of Lima 75th Anniversary: The Journey of Faith Continues"
What Is ... A Ministry? Ministry, simply put, is serving God's will. There are Ordained Ministers and Lay Ministers; both sharing and expressing God's love for us by reaching out to those in need, be it by celebrating together at Mass, serving the needs of our Parish, or going a step further outside of our Parish to touch the lives of others. God has blessed each and every one of us with special talents. It is up to us to identify and develop these talents and then to use them in God's stead. When we use these talents for the benefit of others, with God as our focus, we become ministers and what we do becomes our mission in life; hence, a ministry is born, forming a glorious trinity. Each is served in unique ways; God, by spreading His good Word to others and using the blessings He bestowed upon us; the minister, by utilizing our God given talents to reach out and touch the lives others, making their life, hence ours, a little bit brighter; and the ministry, those whom receive the benefit of our presence in their life, in body or in spirit, in dollar or in deed, are renewed in their faith with God and with the world. If you would like to participate in any of the ministries above, or if you have an idea for a ministry, please contact the Rectory at 814-944-8509. Here at Saint Rose of Lima, we have a Parish Council, Catechesis Council, Finance Council, and Liturgical Council. If you would like to participate in any council or if you would like to bring a topic of interest to any of our councils, please contact the Rectory at 814-944-8509. Then I heard the voice of the Lord saying, "Whom shall I send? Who will go for us?"